A fisherman has captured footage of a rare incursion by a whale into relatively shallow waters off the coast of Brittany. | Une baleine en rade de #Brest ! 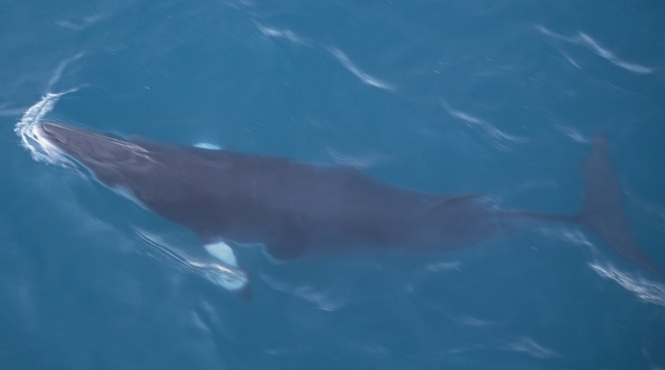 The animal - identified as a common minke whale - was sighted in the rade (bay) de Brest on April 9. The footage was released on social media by the Oceanopolis association. In a statement, Oceanopolis said that while minke whales are regular visitors to seas off the coast of Brittany, they rarely enter the bay. "The rade de Brest is a shallow area and therefore uninteresting for whales," marine mammal expert Christine Dumas told Ouest France. "This individual was certainly following prey ... Maybe he's already gone back out to sea." Adult minke whales can reach up to 9m in length, and while they do not pose a threat to humans, they can hinder shipping navigation in the confines of a bay when they come up for air. The bay has been an important military port and has several military installations including a submarine base at the Île Longue.